We’d love your help. Let us know what’s wrong with this preview of The Teacher's Mail Order Bride by Cindy Caldwell. Love isn't always where you think you'll find it. Sometimes it's right in front of you. Rosemary Archer is tired of just gathering eggs and milking cows. She wants to follow in her sister Meg's footsteps and explore beyond Archer Ranch. When a new headmaster arrives in Tombstone, a position as a student teacher opens up and seems ideal to Rose—if she can get her father to Love isn't always where you think you'll find it. Sometimes it's right in front of you. Rosemary Archer is tired of just gathering eggs and milking cows. She wants to follow in her sister Meg's footsteps and explore beyond Archer Ranch. When a new headmaster arrives in Tombstone, a position as a student teacher opens up and seems ideal to Rose—if she can get her father to agree. Meg won him over, so hopefully she can, too. Michael Tate, the new headmaster, is looking forward to the challenge of creating a larger school for the increasing number of children. He is excited about his new role and gets started. When the school new board is elected, Michael learns that there is an added stipulation to his continued employment—he must take a wife. Michael is frantic to keep his position and advertises for a mail order bride, sure that is the only solution. Rose and Michael work closely together as he waits for his mail order bride to arrive. He begins to wonder—is marrying a stranger his only option? 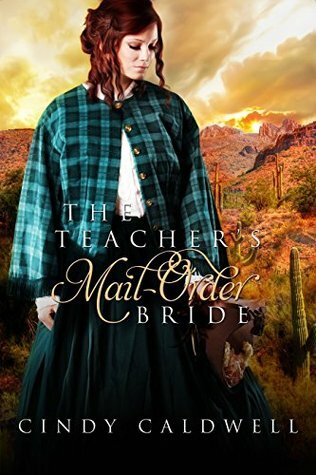 To ask other readers questions about The Teacher's Mail Order Bride, please sign up. Rose has always loved school. When a new headmaster comes to town she decides she wants to volunteer in his classroom. Michael is required to be married. A fact that wasn’t brought up until after he had signed the contract. They also required he marry very quickly so he wrote away for a mail-order bride. This is a lovely book of two people anxious to help young people learn. I enjoyed reading it. This 'free' Kindle Unlimited ebook definitely was a sweet and clean tale about a mail-order bride. Both parties agreed to become a partner in marriage. I must say that the women in this series are tremendous role models. They were independent, strong, and respectful toward their families. Each worked together with their husbands as a team. The men are hard working, loving, and handsome! Who wouldn't want to spend time with them? The proofreader must have dozed through their responsibilities to this series, since there were multiple grammar errors. In this tale, Rosemary and Michael are drawn together and face their individual struggles on the road to marital bliss. First, this isn't really about a mail order bride unless you count the one who was promised a marriage and it never happened - to that bride. Overall not a bad story or plot. However, I would have done a bit more about them fighting or acknowledging the feelings. Also, I would have done more around the mail order bride part and make that seem more a part of the story rather than a thrown in statement and scene here and there. It felt very under done (picture near rare if you were cooking a steak First, this isn't really about a mail order bride unless you count the one who was promised a marriage and it never happened - to that bride. Overall not a bad story or plot. However, I would have done a bit more about them fighting or acknowledging the feelings. Also, I would have done more around the mail order bride part and make that seem more a part of the story rather than a thrown in statement and scene here and there. It felt very under done (picture near rare if you were cooking a steak). The writing and thought processes are the characters were well done other the areas I've outlined above. The love story of Rose and Michael. Michael is a book teacher from Boston and he has come to Tombstone to be the Head Master of the school. After sign the contract, he is told he has to be marry or he can not have the job. So he send for a mail order bride, while weight for his bride he fall for Rose. Can he marry other when he love Rose? Great story. Does this series have any mail order brides? Don't know, but it's filled with young couples and local people. One thing, the dress in the cover art is in the book. A sweet little book that's a nice read. Recommended for those who like the genre. I really enjoyed this sweet, clean romance. Reading from both Rose's and Michael's perspectives added more depth to the story. As a teacher, I appreciated their passion for education and the care they exhibited for their students. The developing romance was written well and kept pace with the rest of the story. Although the ending was expected, I still found myself smiling at the HEA. What a delightful romance. Even though you know how it is going to end, it is worth reading to see how it plays out. A short read. Would enjoy knowing more about the Archer family--next book in this book for sure. This book was a clean romance. It was pretty good but a little dry. I had a hard time connecting to the characters, but I think that was more me than anything the author did or didn't do. Life and love happens whether it is convenient or not when the time is ripe. Will they be able to recognize it before things go too far? Rose is such a geek but with a very big heart. Just loved this character but she took a while to determine what she was feeling. Old biddy who is over the school committee needs to get over herself. Great story about love and listening to your heart and doing what's right. Also just how important education was even 'out west'. Rosemary Archer loved school so much she's actually sad that she's graduated and can't go back. But she jumps at the opportunity to volunteer as a teacher's assistant to the new headmaster. Again, continuity issues but overall a good read. I love this series. Clean romance, error free writing, but overall quite boring. There was much repetition about the fact that some children are not allowed to come to school. This was a very sweet story. I am so happy it ended with the right people getting married. Read it and enjoy! This begins slow and is difficult to continue reading. However, the major characters are well developed and the background tends to be authentic. This is a good book to read when you need a feel good, happy ending book to read. Why not? Rose's story has held me tighter 5han the rest! But I do love them all can't wait to start Saffrons next! What a beautiful story! Michael and Rose will have your heart bleeding for the undiscovered love they hold for each other and the circumstances that they have found themselves thrust upon them. Michael has moved from Boston to Tombstone as their new headmaster of the only school, only to find that the contract he has with them suddenly has stipulations that are extremely unreasonable and seem to be solely in place for boosting the ego of the chairwoman of the board. But, with some help from a ne What a beautiful story! Michael and Rose will have your heart bleeding for the undiscovered love they hold for each other and the circumstances that they have found themselves thrust upon them. Michael has moved from Boston to Tombstone as their new headmaster of the only school, only to find that the contract he has with them suddenly has stipulations that are extremely unreasonable and seem to be solely in place for boosting the ego of the chairwoman of the board. But, with some help from a new friend, he's determined to accept the challenge and fulfill the boards requirements. Rose, always a studious person, feels that collecting eggs and milking cows is not what she's cut out to be, so when an opportunity arises that would not only help the children of the town, but also help her attain her own dreams, she jumps on it. But life doesn't always deal us a hand that we want. Will Rose and Michael ever get the chance to explore new feelings? Or will they both forever be doomed to a life with others? Another sweet and cozy read - developing the stories of friends and family in Tombstone Arizona. As Rose struggles with dreaming of her future, she meets the new headmaster for the school that she loved. It occurs to her that she could volunteer there to help him along with Suzanne. As she works alongside Suzanne and Mr. Tate at the school, she finds herself more and more caught up in the need for education for all children, not just for those fortunate enough to not need to work so their family Another sweet and cozy read - developing the stories of friends and family in Tombstone Arizona. As Rose struggles with dreaming of her future, she meets the new headmaster for the school that she loved. It occurs to her that she could volunteer there to help him along with Suzanne. As she works alongside Suzanne and Mr. Tate at the school, she finds herself more and more caught up in the need for education for all children, not just for those fortunate enough to not need to work so their family can eat. Meanwhile, Mr. Tate has been informed that he must be married, or forfeit his position. Suzanne takes him under her experienced wing and helps him find a mail-order bride. I really enjoyed this sweet, clean mail-order bride story. The premise was unique and the writing was solid. The characters in the story are each unique and each come with their own problems and quirks. I like how this sets it apart from the majority of other mail-order bride books. Even though the couples meet and fall in love quickly the way that the story leads up to the ending you can feel a connection between them and the appearance is that it was longer. The book did not feel rushed at all I really enjoyed this sweet, clean mail-order bride story. The premise was unique and the writing was solid. The characters in the story are each unique and each come with their own problems and quirks. I like how this sets it apart from the majority of other mail-order bride books. Even though the couples meet and fall in love quickly the way that the story leads up to the ending you can feel a connection between them and the appearance is that it was longer. The book did not feel rushed at all and when done reading you feel like you read longer than you actually did. I thoroughly enjoyed reading the book and immediately went searching for the next book that came after it. If you like mail-order bride novels or short (less than a 3 hour read), then this is good author to pick up and read. Sweet little story but I feel the it was badly titled. The bride in the story isn't a mail order bride. In fact, she doesn't have a terrible large part and really is just a hiccup in the couple's story. Her part is more of a block between the characters before she ever arrives.